The students, accompanied by module coordinator Dr Anne-Maria Brennan of the School of Applied Sciences, were given 'access-all-areas' privileges to see the College's treasures and watch it at work. Of particular interest was a fascinating set of apothecaries medicine jars all made in nearby Bermondsey back in the 1600's, some of which were owned and used by the famous diarist Samuel Pepys. Back in the 21st Century they saw Fellows and Members, all senior medics and experts in their field, in their ceremonial robes being greeted by their family and friends. Central to the visit was a private viewing of the special exhibition The Mirror of Health. This exhibition explores the multicultural roots of biomedicine and traces the development of medicine outside of Europe during the so called Dark Ages. 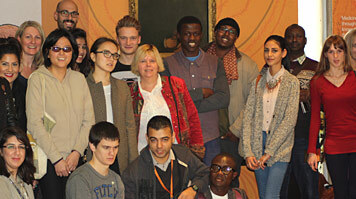 "This was a must-see exhibition and I was determined that the students would get a chance to see it," said Dr Brennan. "Its cultural relevance is immense, particularly in Black History Month as it shows how science crossed continents during times when long-distance travel was more arduous. Many of these pioneers of medicine are great role models." When quizzed more closely on her personal favourites she admitted to having many but said that Constantine the African had a compelling back-story. "He was a Tunisian medical scholar who studied in North Africa and Baghdad around 1065. He translated ancient Babylonian, Greek and Indian medical texts into Latin and Arabic and used them as sources for his own research. In later life, as a Benedictine monk, he wrote the first documented textbook on infection control, produced to assist pilgrims attending the Hajj. He was a true polymath and showed how science can cross cultures" she said.